The “Blog” of “Unnecessary” Quotation Marks: trips to "vegas" eh? I don't even know what a fake version of vegas would be. But I think it would make Baudrillard's head explode. Maybe they only get you to the desert nearby. Thanks, Eamon. 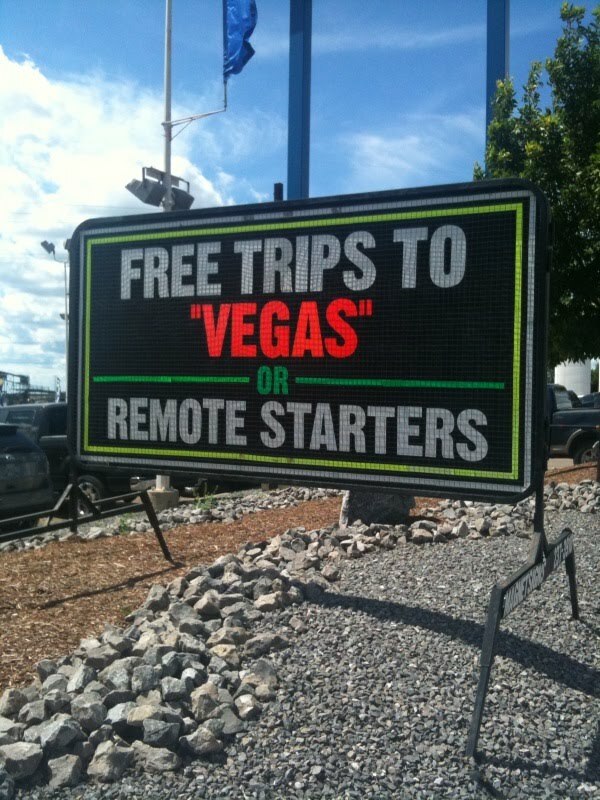 trips to "Vegas" OR remote starters? i don't follow. Maybe the trip to "Vegas" is a remote starter--Your trip to "Vegas" doesn't start IN "Vegas." The funny, it is not with me yet. Where is my coffee? Sure would like to know more about this one. Looks like it might be at an airport - there's a windsock looking thing in the background. Maybe they mean a remote starter for a car or plane or maybe even model plane. Obviously you're going to win the remote starter because that's cheaper than a trip to "Vegas", like a carnival prize. I checked Google Maps to see if there are any other towns just called "Vegas", but apparently there aren't. Maybe it's missing an 'f', making it free trips to vegas 'for' remote starters... THere is a Vega star in the constellation Lyra, now that's REMOTE.